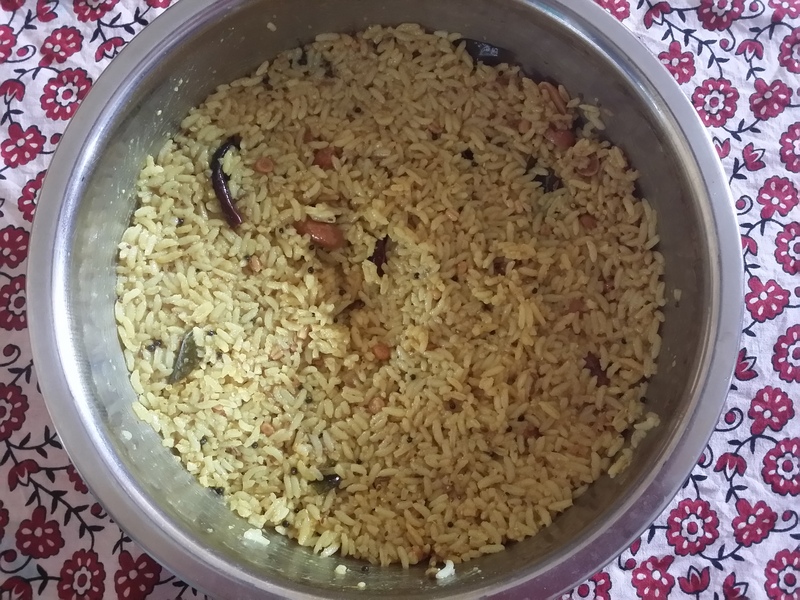 Andhra Puliyohara – Durga's Delicacies. Charming to those of Refined Taste. Andhra Puliyohara is an idea i got from Raks Kitchen and i surfed the web for many recipes . Finally i remembered my friend’s recipe and followed hers . The recipe is here. 1. Soak a ball of tamarind and extract juice from it . 2.In a pan add oil and when hot add hing, little jaggery , little salt and the tamarind juice. Let this boil in slow flame till you get a thick paste. then switch off the flame. 3.Cook the rice in the ratio 1:2 rice and water and spread it in a plate . 5.In a pan add oil and then add hing, mustard seeds ,cumin seeds, ground nuts , channa dal, urad dal, dry red chilli, curry leaves , green chilli , crushed ginger and fry well. 6. Add a dash of turmeric powder, salt , mustard powder and gingelly oil to the rice and mix well. Then add the tamarind extract and the the tempered ingredients. Mix well and serve after 2 hours so that the juice gets inside the rice.